Honda’s line of private jets have always been technological marvels, and their latest revision is no exception. The new HondaJet Elite increases fuel range over the original, is quieter, and has upgraded sound and avionics systems. 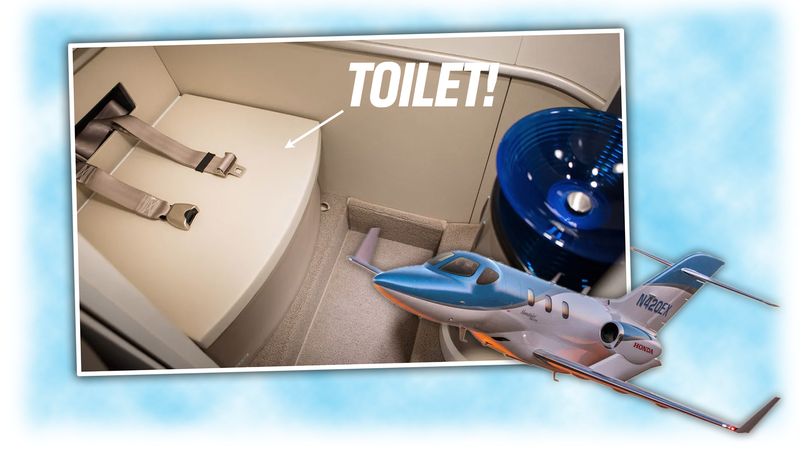 The big news, though, is the HondaJet Elite’s fully-enclosed lavatory, which has a toilet with full seat belts, allowing for the no-compromises defecation needs and HondaJet’s clientele demands. Since more than 90% of our readers own private jets (estimated) this is very relevant news, and if I know our readership, they won’t even bother considering an aircraft if it does not allow them to lavishly evacuate their bowels at 485 MPH and in a 45 degree banked turn. The new HondaJet has a 1,437 nautical mile range, which means there’s plenty of in-air time to move your bowels, which you can now do in absolute safety and security. The HondaJet’s unique above-the-wing engine placement with their all-new noise attenuating honeycomb-pattern inlets that drown out high-frequency noise means that when you’re strapped onto that commode, the only sounds you’ll hear are either from the new Bongiovi Aviation audio system or the straining sounds of your lower colon as your body expels wastes in the comfort of your private jet. Clearly, Honda’s new Flying Toilet is among the best ever developed, and while pricing or delivery dates have yet to be released, I’m sure this aircraft/bathroom will be the choice for discerning aerial defecators worldwide.